Probably the best known parishioner of all times was George Friderick Handel. He came to live in Brook Street in 1724, just as the church was nearing completion, and almost at once he was involved in the affairs of the new parish. His opinion was sought on the suitability of the organ, and when candidates for the post of organist were being tested, he supplied a theme for extemporisation. From then onwards he had his pew in the church and was a regular worshipper. He loved England and in 1726 he became a naturalised British citizen. 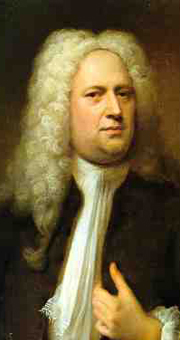 It was in his house in Brook Street that he composed some of his greatest works, including "Messiah". In 1751 his sight began to fail, and by 1753 he was totally blind, but continued to compose, dictating to his amanuensis, John Christopher Smith. He was crippled with arthritis, but still made his way to St George's. Sir John Hawkins tells us "For the last two or three years of his life he was used to attend divine service in his own parish church of St George's, Hanover Square.......expressing by his looks and gesticulations the utmost fervour of devotion." He died in 1759 in his house in Brook Street (now No. 25).